Our favourite Baby Toys for Age Zero and above. 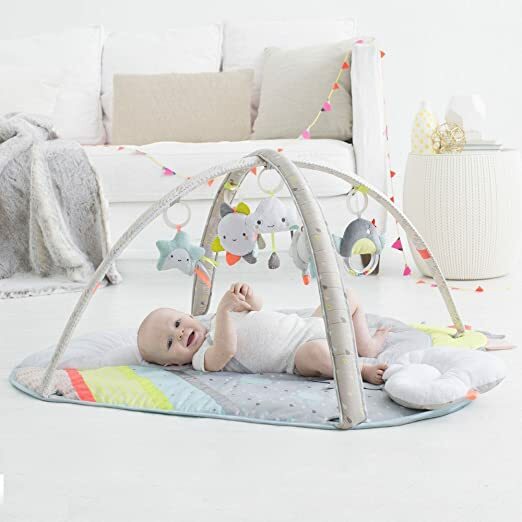 1) Silver Lining Cloud Activity Gym – Baby Toys. Polyester, Imported. Developmental activities include: musical sheep, light-up star, cloud squeaker, bird rattle and baby-safe sunshine mirror. Ages 0+. Activity mat and tummy time pillow should not be placed in crib or playpen. 2) Rainforest Music & Lights Deluxe Gym. 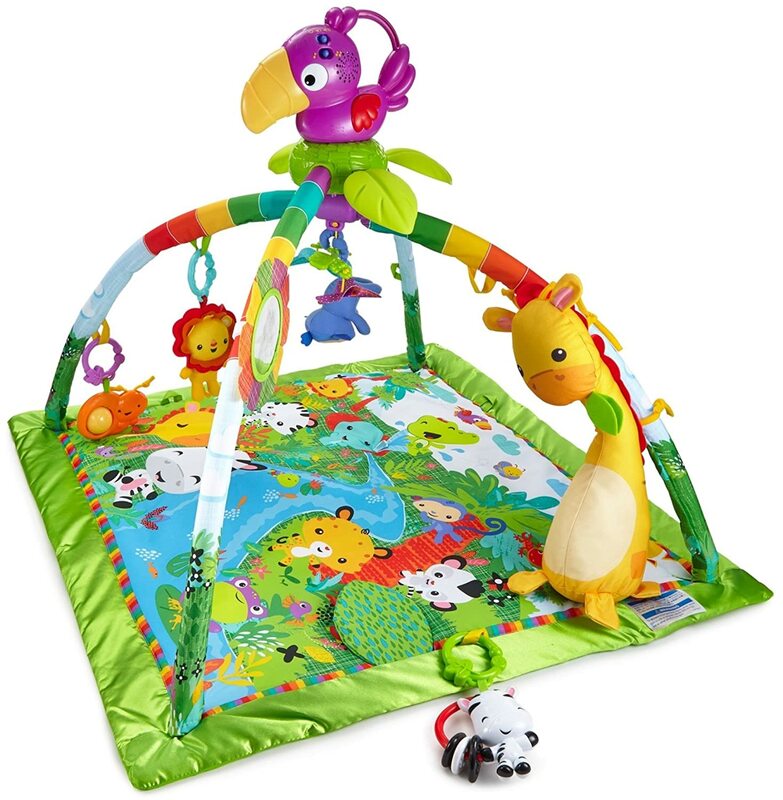 Deluxe newborn gym with 10+ toys and activities and a removable, take-along toucan with music and dancing lights. Three ways to play: Lay & play, tummy time and take-along. Responds to baby’s movement with music and lights in short-play setting. Up to 20 minutes of music in long-play setting!. Removable, take-along toucan – press its wing or give it a gentle shake to activate tunes & lights. 3) Vibrant Village Smart Lights Activity Gym. Baby Toys – Ages 0+. Three ways to play: overhead play, tummy time, playmat. Interactive, musical light-up arch with volume control and two light modes: visual tracking for baby to follow and an amazing light show. 17+ developmental activities. Bold, high contrast artwork. Four hanging reversible toys with black and white on one side and bright colors on the other: Kitty with grab rattle rings; Soft car with squeaker and tactile ribbons; Hot air balloon with baby-safe mirror; Dog rattle with ladybug teether. Three fun sound effects as baby bats at toys. 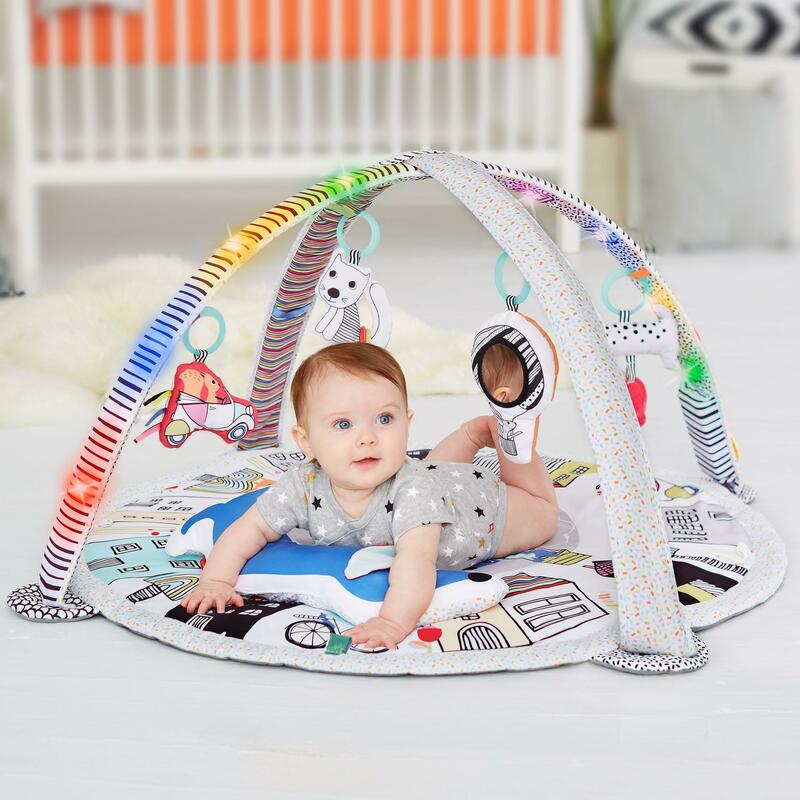 Colorful mat with iridescent toy loops for tummy time. Dog shaped tummy time pillow with crinkle ears. Three AAA batteries required (not included). 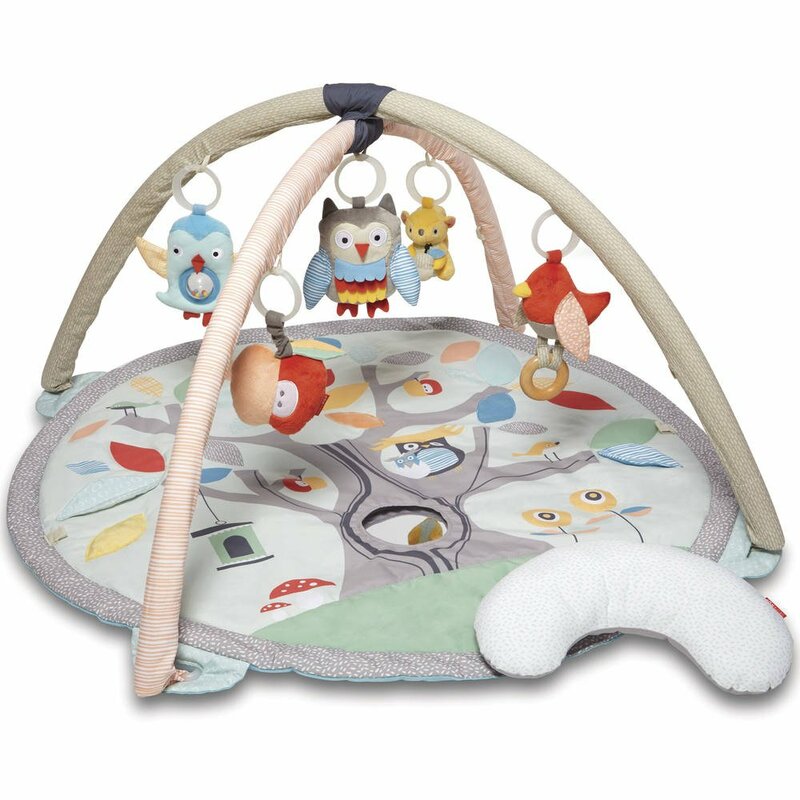 4) Baby Treetop Friends Activity Gym/Playmat. Baby Toys – 17 developmental activities. Nature-inspired graphics and textures. Five playful multi-sensory hanging toys. 13 loops to hang toys low or high or on the mat. Multiple fabrics plus activities on the mat: crinkle leaves, squeaker flower and baby-safe mirror in the tree trunk (mirror is removable for machine-washing). 5) Baby Infant and Toddler Camping Cubs Activity Gym and Playmat. Baby Toys – Polyester, Imported. Ages 0+. Size (inches): 36l x 36w x 38h; (cm): 91l x 91w x 97h. Four ways to play: Overhead play, tummy time, seated play, playmat. 17+ developmental activities include: light-up firefly, turtle mirror, bear rattle and musical raccoon with wooden teether that plays “Twinkle, Twinkle Little Star”. Scenic mesh backdrop. Unique, soft supports with woodgrain pattern and rope ties. 6) The Play Gym by Lovevery. Baby Toys – Grounded in science for playtime with purpose. Thoughtfully designed by child development experts. A whole year of play in one box. 5 development zones on the Play Mat that reveal or conceal to prevent overstimulation and promote brain and motor skill development: Learning to focus; Making sounds; How things feel; Hiding and finding; Exploring colors. 24 stage-based play activities, organic ball & teether, sustainable wood batting toy, 4 interchangeable learning card sets – black & white, body, objects, mirrors. Crafted using 100% baby-safe materials, including FSC-certified wood and organic cotton mouthable accessories. Sustainably-sourced wooden legs for stability, 2 minute setup and take down, no tools required. Converts to play fort for toddlers. 7) Baby Toys Infant Rattle Teether Roly-poly Tumbler Set Mobile Musical Hand Bell Newborn Develop Toys for Baby 0-12 month Gifts. 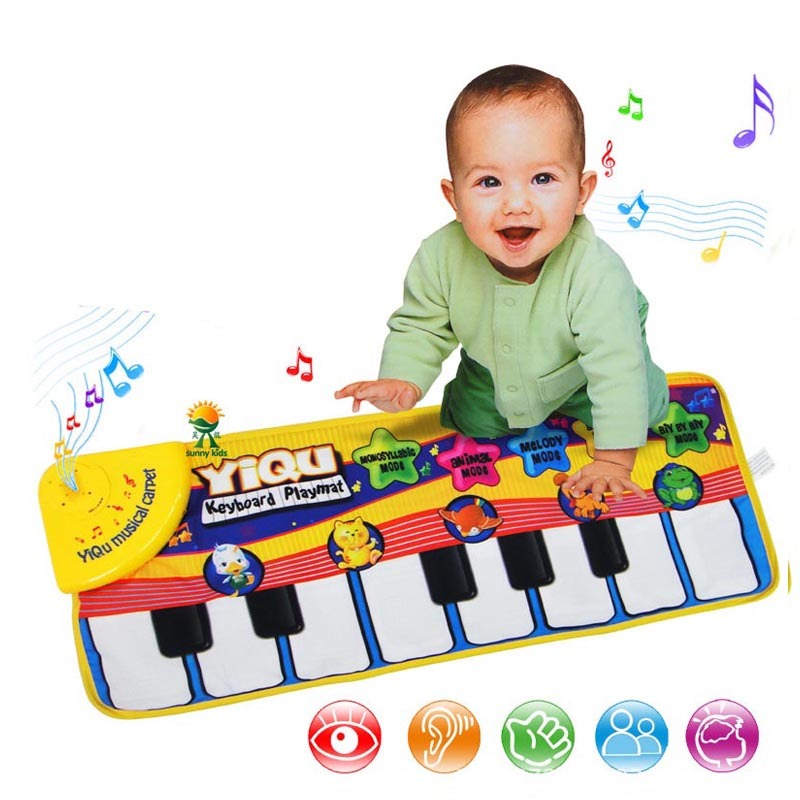 8) Infant Baby Piano Playing Toy With Funny Music And Animal Sounds Crawling Mat Bay Kids Educational Gift 72*29cm. 9) Infants Cradle Cute Rabbit baby music hanging bed safety seat plush toy Hand Bell Multifunctional Plush Toys. 10) Baby cribs Rattle babyplay Baby Hand Bell Multifunctional Plush Toy Stroller Mobile Gifts infant travel arch.